When three friends spot a litter lout adding to the problems on London’s street, they decide enough is enough. 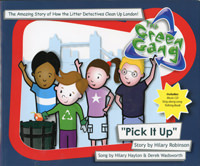 With the help of the Green Gang, they become Litter Detectives, and form their own pop group, performing their own song called, “Pick It Up” to help clean up London. The result? A great story, a catchy sing-along song, and with the help of all the kids in London, the largest detective force in history. But will they clean up our capital? See a copy & you will definitely Pick It Up! What a fantastic story that addresses the massive problem of litter. A super cast inc. Recyclit Rik (The Green Gang hero) & the Trott family (A talented bunch of musicians). The Green Gang answer the request of 3 London School children who want to clean the streets of London & rid it of litter. Included in the book is a brilliant music CD that you can play in the CD player or put into a computer & you get a sing a long karoke style potential chart hit. An excellent idea is the talking book that also comes on the CD... the book seems expensive but is certainly value for money when you remember the CD is included. Well done to The Green Gang, a refreshing look at the environment.